U.S. Olympic swimmer Ryan Lochte grabbed the gold medal in the 400m individual medley, defeating 2008 Olympic eight-gold medalist Michael Phelps. He was way ahead of Phelps right from the start, winning his first gold in London and finishing an amazing time of 4:05:18. Lochte predicted that this would be his year and with the first win on his first race, he was right on track. “I think I'm kind of in shock right now,” he told reporters. “I know he gave it everything he had. That's all you can ask for,” referring to Phelps. “I felt fine the first 200, then I don't know. They just swam a better race than me, a smarter race than me, and were better prepared than me. That's why they're on the medal stand,” said Phelps after failing to win any medal for the first time since he joined the 2000 Sydney Olympics where as a 15-year-old unknown then and he qualified only for one event. Since then Phelps went 16-of-16, winning 14 golds and two bronzes. Thiago Pereira of Brazil took the silver and Kosuke Hagino of Japan won the bronze edging Phelps by a margin of 0.34 of a second. Phelps still has three more chances at a threepeat before he's done in London, having also won the 200 individual medley, plus the 100 and 200 butterfly in Athens and in Beijing. He won six gold medals in Athens, then a set record of eight golds in Beijing to break Mark Spitz's Olympic record. Both American swimmers are aged 27. But Phelps nearly failed to qualify for the 400m individual medley finals where he became the eighth and last qualifier just ahead by 0.07 second from the ninth placer Beijing silver medalist Laszlo Cseh during the qualifying race. “I didn't expect those guys to go that fast. I just wanted to try to get some good underwater, try to get some good times. I think the only thing that matters is really getting a spot in the final,” admitted Phelps. Lochte, like Phelps, is a three-time Olympic champion, but in Beijing, his success was overshadowed by Phelps' eight golds. It was billed as the showdown between the world’s two greatest swimmers. Lochte was lightly ahead of the field after 100 meters of freestyle. And he expanded his lead after the backstroke and breaststroke. At the finish, the second placer was three body-lengths behind. Phelps is on his last seven races this Olympics before finally retiring. But on the first race it seemed that he was ready to call it a career. He struggled to pull himself out of the pool and looked thoroughly tired as if to signal the early changing of the guards in the waters. 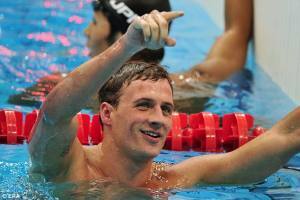 “I’m here to win,’ Lochte said. 'I’m going for gold. The trials was just an appetizer. This is my meet.” Strongman competitor Matt DeLancey trained him starting March 2009 with winning in this Olympics his ultimate goal.